Achoo! Achoo! Oh, the dreaded sound of ragweed season. Allergists call ragweed season one of the “Four Seasons of Hay Fever,” and with good reason. Whether it is tree pollen, grass pollen, mildew and mould, or ragweed, the result for us is always the same: coughing, sneezing, sniffling, aching misery. But there is a way to fight back against fall allergies. Since the average Canadian spends an estimated 90 percent of the day indoors, keeping your indoor air free from common fall allergens can make the difference between enjoying the beauty of fall and suffering through the fall season. 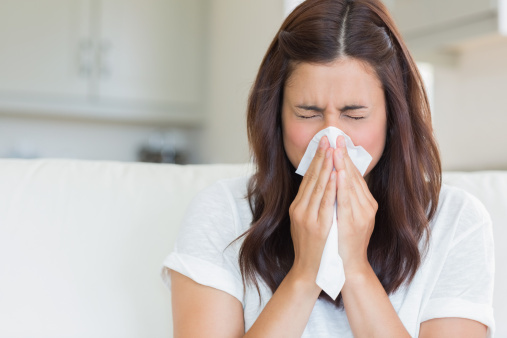 In this post, learn tips for how to keep those nasty fall allergens out of your indoor air supply. Ragweed has a very nasty reputation, but what is it and where does it come from? And how does it weasel its way into our indoor air supply? Ragweed is a type of plant so good at producing pollen that it is considered a primary culprit for fall allergies. Since there are at least 17 species of ragweed and they can grow anywhere there is a bit of green space in North America, it is easy to see how ragweed season has become a dreaded time of year for many people. Ragweed, like other allergens, triggers your body to release a substance called histamine. Histamine’s job is to fight off the pollen, which your body perceives as dangerous and toxic, by any means necessary. Often, this includes inducing a runny nose, sneezing, itching eyes, and other defensive tactics. According to the Environmental Protection Agency (EPA), the recent effects of climate change are also weighing in on this already weighty health issue. Climate change is extending the warmer months of the year in many areas of the world, which means these toxins begin entering the air as early as July. The warmth that enables mould and mildew to multiply, then interacts adversely with the release of the ragweed pollen and pre-existing airborne toxins to worsen even the mildest case of ragweed allergy. Unfortunately, a solitary ragweed plant is capable of generating up to 1 billion grains of pollen each ragweed season. This pollen travels about in the outdoor air and then enters the indoor air supply at home and work by hitching a ride on our clothes and in our hair and even on the soles of our shoes. Once it is inside, it floats free and becomes part of the continuously circulating air. A professional indoor air duct cleaning gets into the recesses of your HVAC’s air duct system. Along with lingering tobacco, chemical odors, and pollution toxins, as well as pet dander and hair, dust, mould, and mildew, and any mites that might be residing within, the air duct cleaning will vacuum out trapped ragweed pollen. An air duct cleaning is the single greatest gift you can give yourself, your family and your employees. In one fell swoop, all the troublesome toxins are simply gone. NOTE: If you have a dryer on the premises, be sure to schedule a professional dryer vent cleaning at the same time for optimal air quality and cleanliness results! Once you have had your air ducts cleaned and vacuumed out professionally, your job becomes one of vigilance and maintenance to make sure all those toxins and pollens don’t build up again. The first step is to change your HVAC air filter and make sure it gets changed at least every 30 days thereafter. The best maintenance is to upgrade to a HEPA-rated air filter. HEPA stands for “high-efficiency particulate filter.” Only HEPA-rated filters can catch up to 99.97 percent of airborne toxins, even small particulate matter that most air filters can’t capture. While an air filtration system, such as a HEPA-rated air filter, portable air filter, or central air filter system, catches inbound airborne toxins and stop them in their tracks, a professional-grade air purifier keeps your indoor air free of airborne toxins and mould by treating it with U.V. light. You can choose between a portable single-room air purifier or central in-duct systems that purify every molecule of air that enters your space. A heat recovery ventilator is the only surefire way to prevent stale, outgoing air from inadvertently getting sucked back into your indoor air supply. By keeping incoming and outgoing air completely separated on two different pathways, a heat recovery ventilator ensures your now-pure indoor air will stay that way for the foreseeable future!